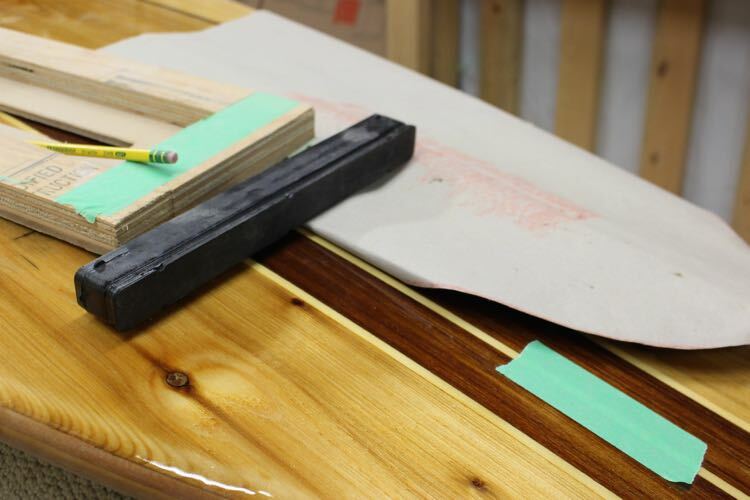 This tutorial will teach you how to install a fin box in a wooden board. 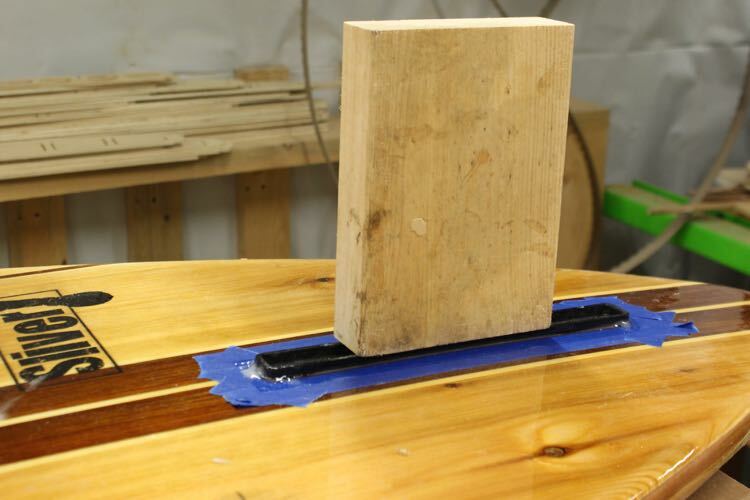 If you are making your own homemade fin box jig make sure you do a test on some scrap wood before using it on your board. Most paddle board Most paddleboard’s centre fins are located between six and six and a half inches from the tail. 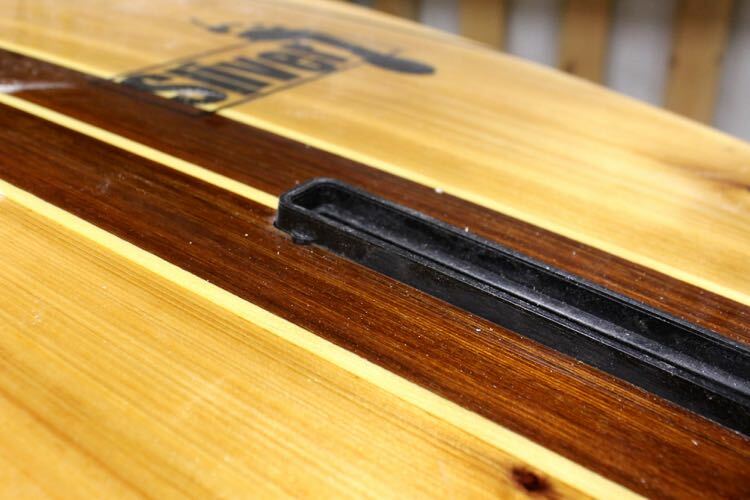 Fin box’s have some built in adjustment so you don’t have to stress. 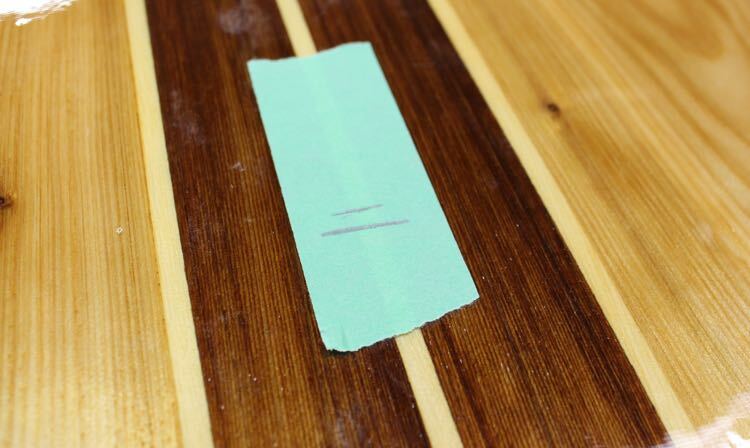 A piece of painters tape is being used as it is hard to see pencil marks on the glossy hot coat. 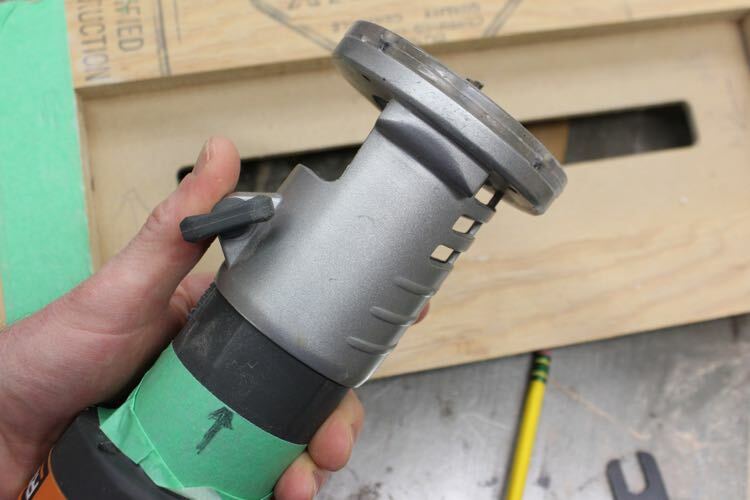 If you make your own jig, mark the diameter bit the jig requires! 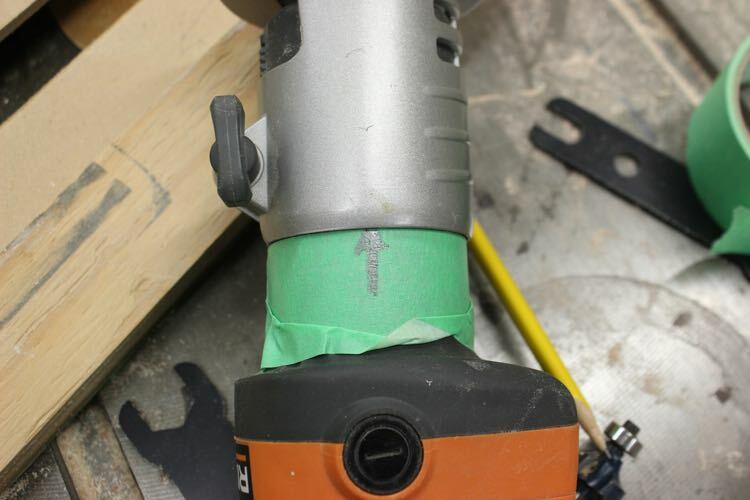 With the correct router bit mounted in the router extend the bit through the jig and set the correct depth. Use the top of the tabs (top of green tape) not the full height of the fin box as everything above then tabs is excess. 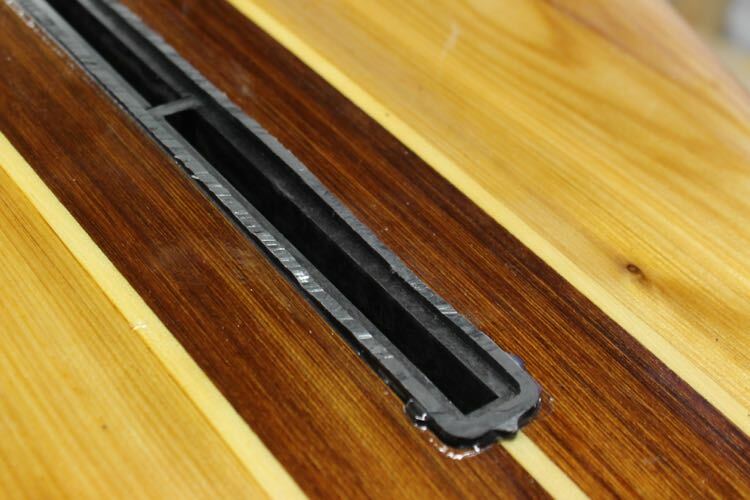 This setting will result in an installation with an equal amount of epoxy resin locking in the fin box on all surfaces. 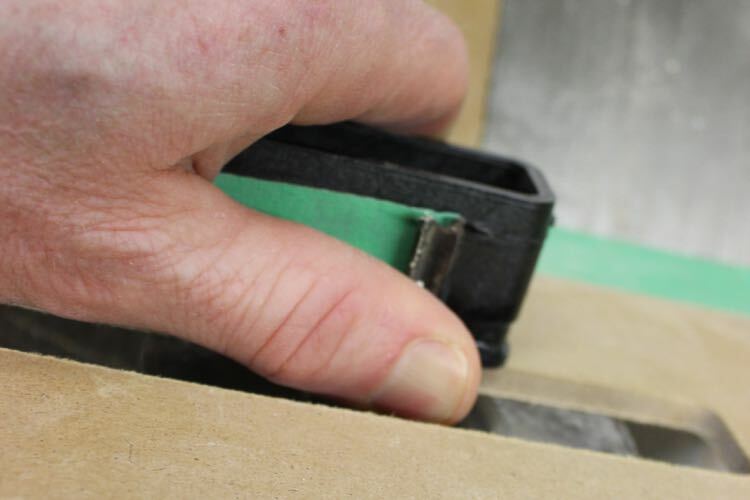 With a foam board you can just plunge the full height of the box as foam has virtually no cutting resistance but on wooden boards it is safer to do a few incremental steps. I use the thickness of the board’s outer skin for the first depth increment and then the diameter of the bit for the rest of the increments until I reach the desired height. This works out to about 4 progressively deeper passes. After the bit height is set you can align the jig with the mark you measured earlier and in this case the stringer is being used for the side-to-side. 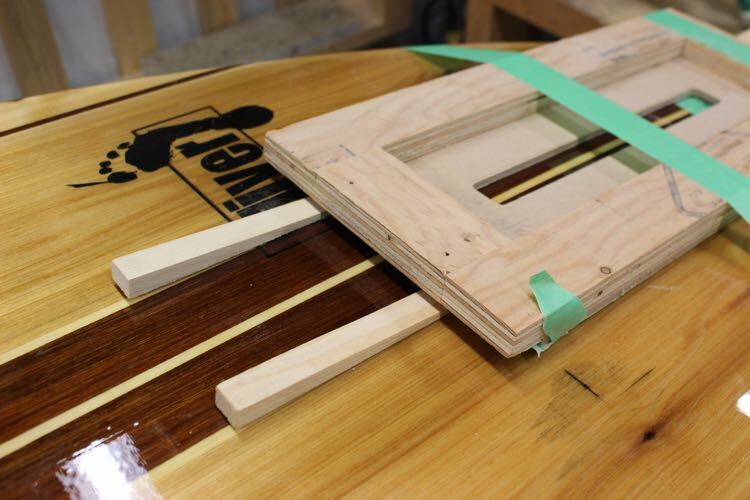 If your board doesn’t have a stringer you should draw a centerline so you can properly align the jig. 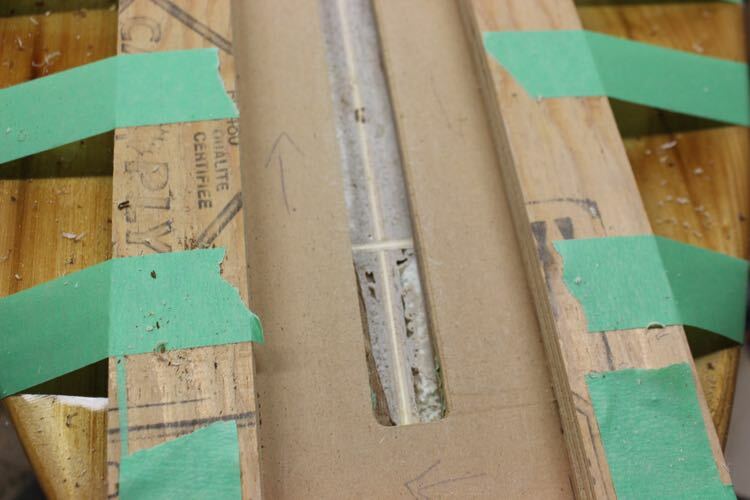 Wooden shims are being used to make sure the jig is true and to allow the flat bottomed jig to sit securely on the curved surface of the board. With your jig anchored rock solid there are many ways route the hole but the easiest way I have found is to plunge in the centre and then cut the perimeter in a clockwise rotation. I then come back and carefully remove the centre bit. This direction has the bits cutting forces holding itself tight to the jigs edge and the waste not hitting me in the face. The other acceptable method is to remove the centre first and then cut the perimeter. It doesn’t really matter how you remove the material as long as the cutting forces are helping you and not you fighting them. With the first pass done you can see the fishbone frame. If you have used foam blocking like shown here be aware that the cutting forces will change as the router bit cuts the denser wood fishbone. The correct direction of travel is shown with the arrows. 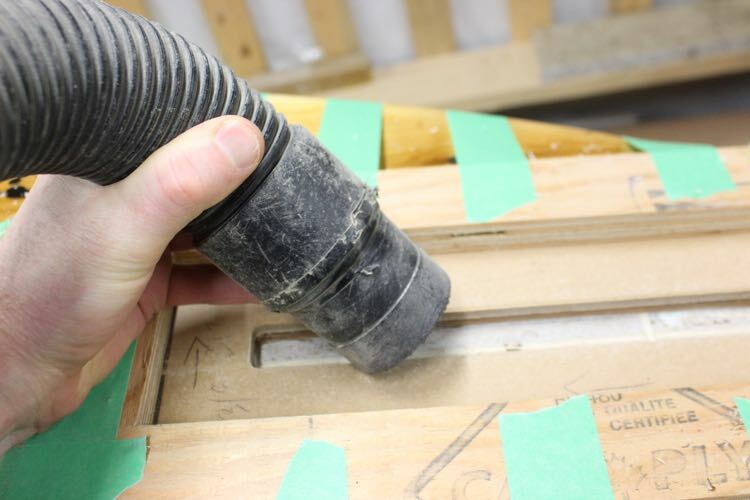 Make sure jig is kept clean to get an accurate cut. 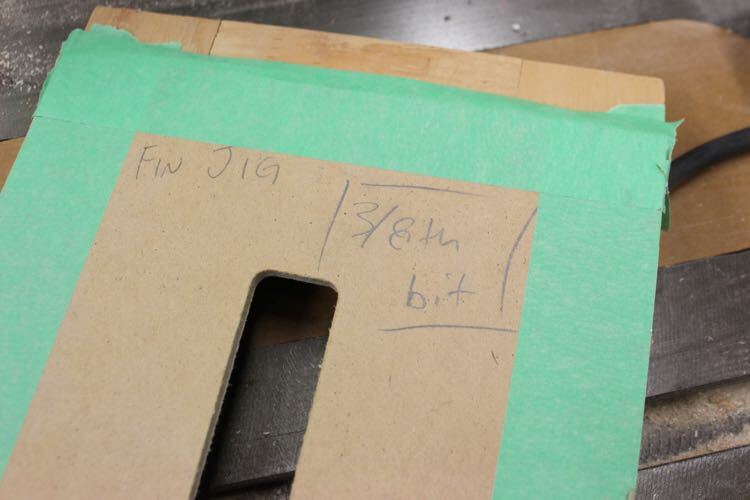 The waste build-up will prevent the router from correctly following the jig. Always vacuum out the jig for the final pass. Uncured epoxy dust should never be inhaled. 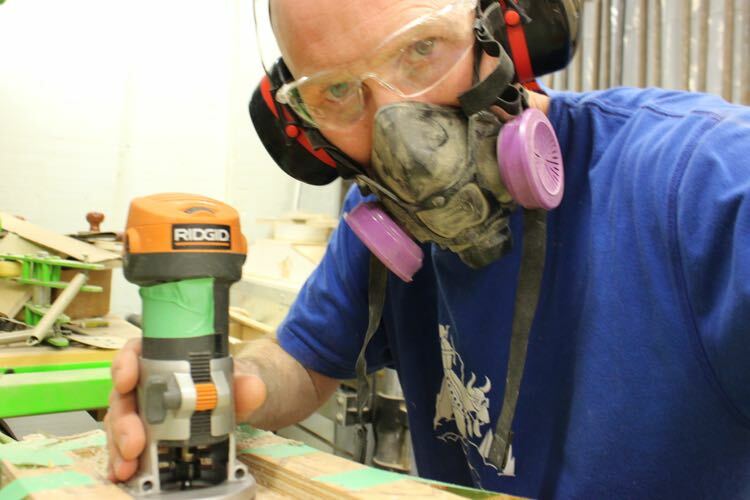 Make sure you are wearing safety gear when ever you cut or sand epoxy! Double-check the depth before removing the tape. You can realign the jig if needed but it is easier to get it right the first time. 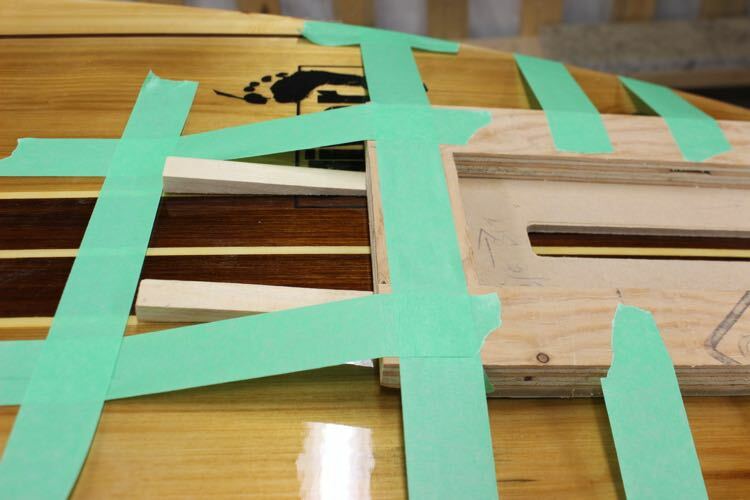 Before you mix the epoxy test your work by dry fitting the fin box. Ideally your fin box rests on the tabs like is show in the picture. This makes aligning the box at right angles to the bottom very easy. 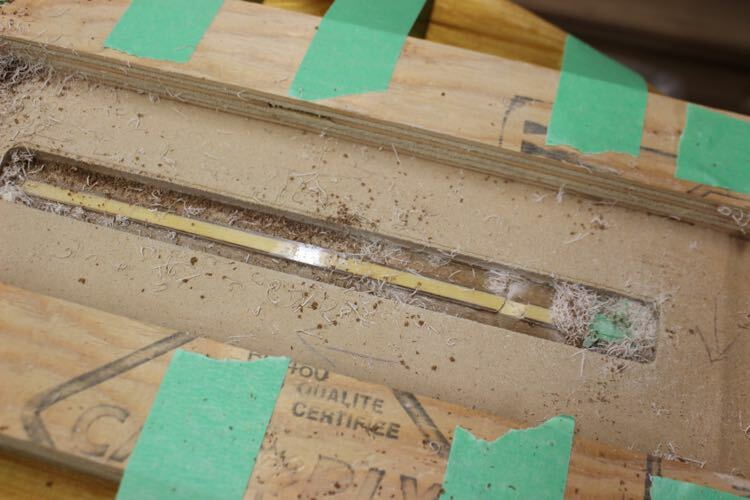 This fin box is hanging about 1/16 of an inch above the bottom of the routed hole. If you go too deep you might want to add some epoxy to fill your mistake as the exothermic reaction of thick epoxy curing can get pretty hot. Your other solution to this problem is to use slow hardener that doesn’t create as much heat. If you raise the tail making the fin area level before you flood the hole it is easier flood the hole for the fin box otherwise the epoxy just runs out the low side. I am using Cab-O-Sil to thicken the epoxy to molasses like consistency for this install. 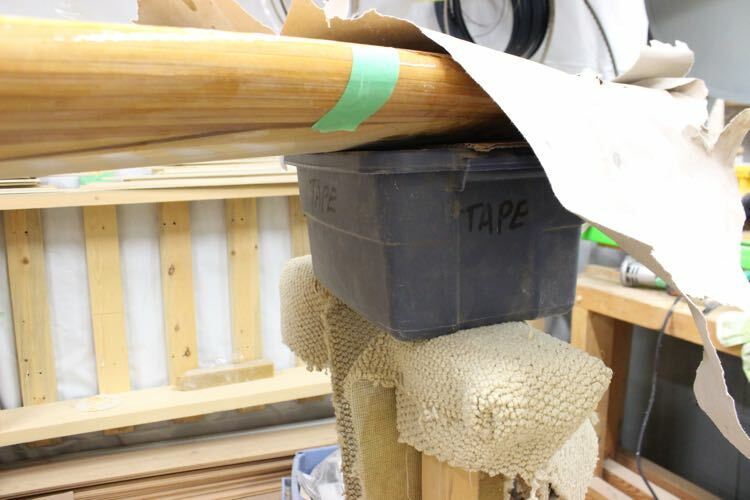 If you do not have commercial thickener just use some sawdust from the orbital sander’s dust bag. 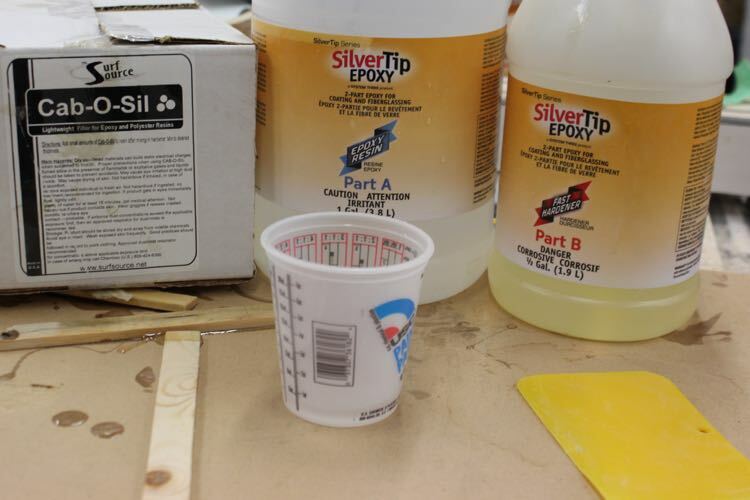 If you use resin without thickener there is a greater chance the epoxy finds a hole in your blocking and drains into your board. Flood the hole first and then lower the fin box into place. You should see epoxy flood out on all four sides between the routed hole and the fin box. This visual confirms that you have used enough resin to properly seal the box. 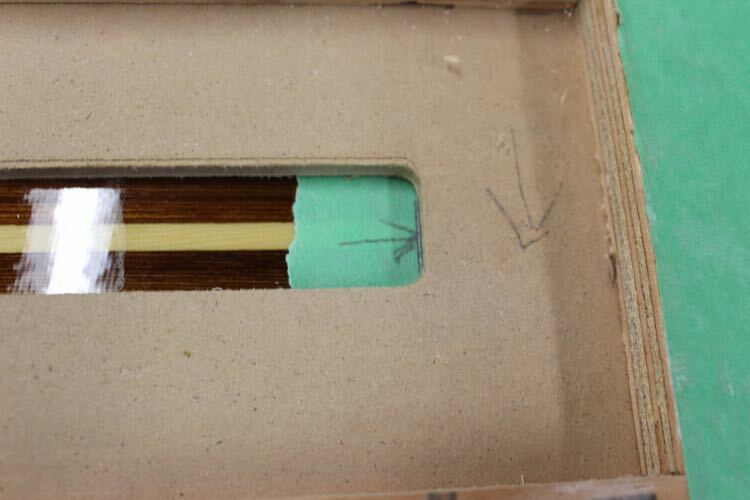 The fin boxes extra material (above the tabs) keeps the resin from flowing into the box. If you mistakenly get ANY resin over this edge wipe it up right away or the fin will not fit. If you have any areas that need more resin you can usually move excess from another spot with the squeegee. Add a weight to the fin box and maybe even a taped guideline to prevent the fin box from floating in the resin. 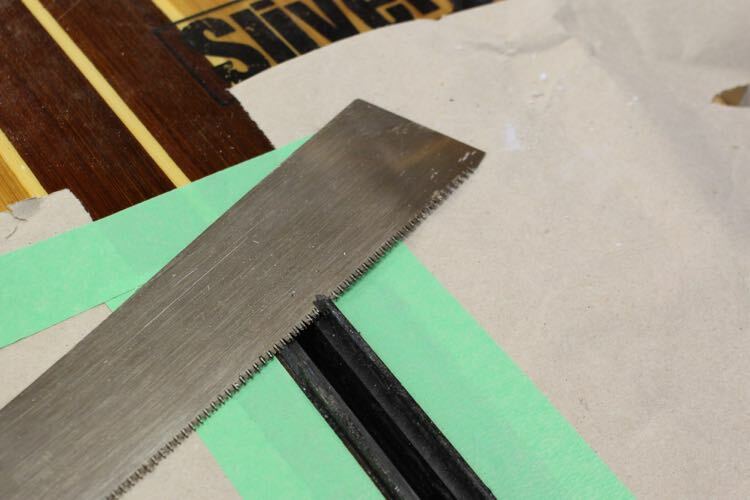 After the epoxy has cured you can quickly remove the bulk of the excess with a flush cut saw. 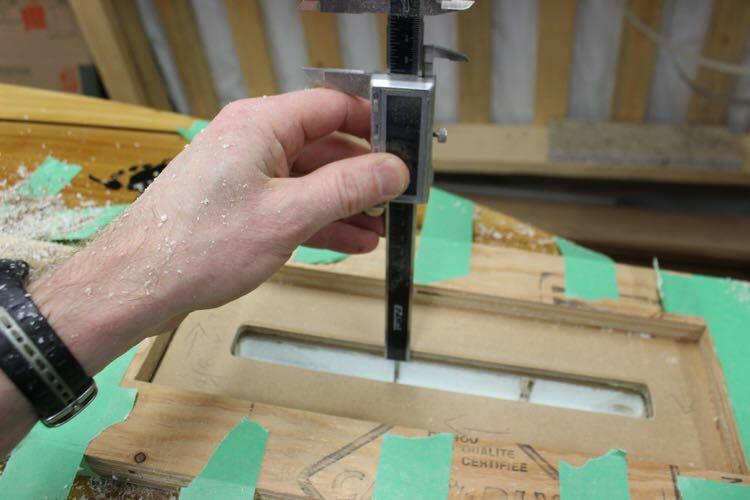 I am using a Japanese saw without a spine that allows me to flex the blade and cut the box close to the board. Professionals just sand this area down with an aggressive disk but it takes a steady hand not to scratch your board. With the fin box trimmed to roughly the height of the tabs, (1/16th proud) it is easy to sand the final bit flush as you do sand the rest of the board prior to doing the gloss coat. Make sure you let the hot coat fully cure before sanding. If the resin is gumming up the sand paper you are wise give it another day since it is unsafe to sand uncured epoxy.